Despite global economic challenges, international tourism in 2013 was well above expectations, with an additional 52 million people travelling the world last year, the United Nations said today, adding that continued growth is expected for 2014.
International tourist arrivals grew by 5 per cent in 2013, reaching a record number of arrivals of just over 1 billion, according to the latest World Tourism Barometer published by the UN World Tourism Organization (UNWTO), which is based in the Spanish capital, Madrid. “2013 was an excellent year for international tourism,” said UNWTO Secretary-General Taleb Rifai. “The tourism sector has shown a remarkable capacity to adjust to the changing market conditions, fuelling growth and job creation around the world, despite the lingering economic and geopolitical challenges. “Indeed, tourism has been among the few sectors generating positive news for many economies,” he added in a news release. UNWTO noted that demand for international tourism was strongest for destinations in Asia and the Pacific (up 6 per cent), Africa (up 6 per cent) and Europe (up 5 per cent). The leading sub-regions were South-east Asia (up 10 per cent), Central and Eastern Europe (up 7 per cent), Southern and Mediterranean Europe (up 6 per cent) and North Africa (up 6 per cent). UNWTO forecasts international arrivals to increase by 4 to 4.5 per cent in 2014, which is above its long-term forecast of 3.8 per cent growth per year between 2010 and 2020. The agency’s Confidence Index, based on the feedback from over 300 experts worldwide, confirms this outlook, with prospects for 2014 higher than in previous years. The regional prospects for this year are strongest for Asia and the Pacific (up 5 to 6 per cent) and Africa (up 4 to 6 per cent), followed by Europe and the Americas (both up 3 to 4 per cent). Prospects for the Middle East, the agency said, are “positive yet volatile” (0 to 5 per cent). Europe led growth in absolute terms, welcoming an additional 29 million international tourist arrivals in 2013, raising the total to 563 million. In relative terms, growth was strongest in Asia and the Pacific, where the number of international tourists grew by 14 million to reach 248 million. The Americas saw an increase of six million arrivals, reaching a total of 169 million, led by destinations in North and Central America. Meanwhile, Africa attracted three million additional arrivals, reaching a new record of 56 million. Among the ten most important source markets in the world, Russia and China clearly stand out, UNWTO noted. China, which became the largest outbound market in 2012 with an expenditure of $102 billion, saw an increase in expenditure of 28 per cent in the first three quarters of 2013. Russia, the fifth largest outbound market, reported 26 per cent growth through September. 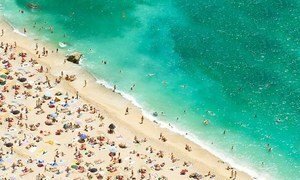 International tourism rose five per cent in the first nine months of the year to reach a record 845 million worldwide, new figures out today from the United Nations reveal.